While wineries now have a significantly increased opportunity to reach consumers directly without having to find national distribution or share their revenues with intermediary tiers, a number of hurdles still remain. These include production caps, on site requirements, and other impediments to direct-to-consumer shipping. Additional issues arise due to regulatory uncertainty regarding how state alcohol beverage agencies will treat “new players” in the wine sales model, including third party providers. In short, e-commerce and the increased ability to ship directly to consumers offers a number of opportunities for wineries, but also raises a number of unresolved regulatory questions. Similarly, social media provides wineries with the opportunity to interact and build relationships with consumers, but may still wonder how federal and state regulations apply to “new media.” Government agencies concerned with transparency and consumer have, by in large, ported their advertising restriction and applied it broadly to social media. This includes tied house laws, which prevent wineries from providing things of value (including free advertising) to retailers. Trinidad noted that regulatory uncertainty is likely to continue as new Internet-based business models appear and blur the line between e-commerce and social media. Finally, Trinidad provided attendees with an update on the Empire Wine / NYSLA dispute. As noted in prior blog posts, NYSLA has accused Empire Wine, a New York based retailer, of shipping wine to states where retail direct to consumer shipping is prohibited, even though those states have not pursued any disciplinary action against Empire. NYSLA believes this action is grounds for suspension, revocation, or cancellation of Empire’s New York State License. If NYSLA prevails, a California winery that illegally ships wine to a consumer in, say, Utah, may be putting their NY Direct Shipper’s license at risk. Groupon to Launch Wine Brand? A search of the USPTO’s trademark database shows that Groupon, Inc. has applied for trademark registration for the GROUPON WINES, CHATTY CAT, JAZZY CAT, SNAZZY CAT, and TOP CAT marks in Class 33 (alcoholic beverages other than beer). It is unclear from these documents what Groupon’s plan is for these wine brands (i.e., whether Groupon will be acting as a third party marketer or has entered into a licensing arrangement with the licensed winegrowers), but it is interesting to see an Internet discount marketplace get involved in the supply-side of the wine market. 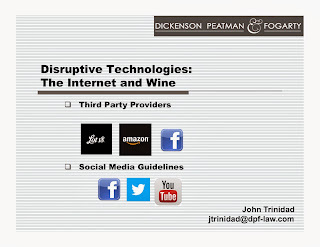 For more information on wine and internet regulations, contact John Trinidad at jtrinidad@dpf-law.com. The New York State Liquor Authority has scheduled a special board meeting for April 23, 2014 to consider two requests for declaratory rulings related to internet wine sales. Both Lot 18 and Connoisseur Encounters Co., Inc (doing business as “The Wine Cellar at Rye Ridge”) have asked the NYSLA for guidance regarding their proposed business operations. The Lot 18 petition is here and the Wine Cellar petition is here. According to its petition, Lot 18 plans to partner with “brand-strong Marketing Agents [such as magazines and other media entities] that have their own consumer lists, readership or website viewers, on-site customers and a recognizable brand” to deliver “personalized wine selections” to consumers. Last year, the NYSLA rejected a request for a declaratory ruling regarding a platform that allowed for third party marketers, such as Lot 18, to operate in New York without an alcohol beverage license. The liquor authority subsequently held a hearing regarding internet-based sales of alcohol beverages, but to date has not issued any further guidance regarding third party marketing. Earlier this year, we reported that Lot 18 had secured a New York state brick and mortar retail license. DP&F does not represent Lot 18 in this matter. For more information on third party marketing, internet marketing, or wine law in general, please contact John Trinidad at jtrinidad@dpf-law.com. Over the past year, the New York State Liquor Authority has wrestled with how to treat third party wine marketers like Lot 18. As we discussed in an earlier blog post, the NYSLA questioned whether third party marketers were essentially operating as unlicensed alcohol beverage retail business. Although the NYSLA has promised to issue additional guidance for third party marketers, Lot 18 decided not to wait, and instead applied for a retail liquor store license which would allow them to legally ship wine to New York state customers. On January 14, 2014, Lot 18 representatives appeared before the NYSLA to answer questions related to their May 2013 application for a liquor store license for a storefront located at 2 Clark Place in Mahopac, New York. Lot 18 provided an overview of their online and brick and mortar operations, how orders and funds would be processed, how they would work with other marketers. After some deliberation, the board approved Lot 18’s request, and a declaratory ruling should issue in the next few weeks. Lot 18’s decision to secure an alcohol beverage retail license is an interesting move by one of the most widely recognized online wine businesses. Most third party marketers have been operating based on an assumption that their business model does not require a state alcohol beverage license. Lot 18 went through a nine month process to apply for and secure a retail license, which will allow them to reach consumers in New York, which is second only to California in direct-to-consumer wine shipments (according to the ShipCompliant / Wines & Vines 2013 Direct to Consumer Wine Shipping Report). Dickenson, Peatman & Fogarty attorney John Trinidad recently gave a presentation at the University of California-Berkeley School of Law on the impact of the Internet on the regulations that govern the wine industry. You can download a copy of Mr. Trinidad’s presentation here. During his presentation, Mr. Trinidad provided an overview of how the spread of e-commerce influenced the Supreme Court’s landmark decision in Granholm v. Heald; discussed third party marketing, California’s guidelines thereto, and New York’s recent hearings on Internet marketing; and also summarized the U.S. Department of Treasury’s Alcohol and Tobacco Tax and Trade Bureau’s social media guidelines. He also discussed the blending of social media and mobile commerce. A few months ago, we reported on the New York State Liquor Authority’s ruling on ShipCompliant’s petition regarding online alcohol beverage sales using third party marketers. We concluded by noting that a “final decision on the permissibility of sales of alcoholic beverages using third party marketers will be forthcoming from the NYSLA and NYSLA intends to hold public hearings on the matter, allowing interested parties the opportunity to present their positions.”The NYSLA has now set a board meeting for Monday, August 12 at 10a.m. to “solicit industry input regarding the regulation of Internet sales.” The meeting is open to the public and will be webcast. If you’re interested in attending, you must notify the NYSLA via email (Internet.Sales@sla.ny.gov) to reserve a seat. The NYSLA has moved the board meeting to “solicit industry input regarding the regulation of Internet Sales” to Monday, August 19 at 10 a.m. The June 2013 edition of Wines & Vines Magazine / Practical Winery & Vineyard Journal contains an article by DP&F’s John Trinidad on working with Third Party Providers to increase winery sales. The article discusses the current state of play in both California and New York — two of the top wine consuming states in the U.S.Click on the image below or on this link to view a PDF of the article (made available with the permission of Wines & Vines / Practical Winery & Vineyard). For more information or assistance regarding third party providers, contact John Trinidad (jtrinidad@dpf-law.com). We have received several questions from clients regarding the New York State Liquor Authority’s ruling on April 9, 2013 regarding the “legality of internet advertising platforms.” The ruling, which addresses the relationship between a New York state wholesaler, a New York state retailer, a third party internet marketer and ShipCompliant, is narrow and specifically applies only to sales under ShipCompliant’s MarketPlace Platform conducted through New York’s three tier system. The NYSLA does however also provide some guidance as to the type of third party marketing arrangements that would be permitted, pending issuance of a more thorough advisory on the matter in the future. It is important to note that the ruling does not address or impact shipping by out of state wineries that hold direct to consumer shipper licenses for New York or the legality of ShipCompliant’s Producer Direct program used by some wineries to assist with their direct to consumer shipments. Following an inquiry into the relationships and responsibility of the involved parties, the NYSLA found that the retailer and wholesaler in this case (the “licensed sellers”) exercised little to no control over the sales being made by the third party marketer/advertiser and played a “passive” role. The unlicensed third party marketer, on the other hand, exercised a “high degree of control over the business operations of the participating licensed seller”, including selecting which wines would be sold, setting the prices at which the wine would be sold, managing the storage and shipment of the wines sold and controlling the advertising for the wines sold, all with little to no oversight from the licensed sellers. According to the NYSLA, the third party marketer also received a “predominant proportion of the proceeds from the sale of alcoholic beverages,” while the licensed sellers simply received a flat fee. Based on these facts, the NYSLA held that the unlicensed third party marketer/advertiser was making sales without a license and that, therefore, the “relationship between the advertiser and the licensed seller in the MarketPlace Platform system” violates New York state regulations which “prohibit a licensee from making its license available to a person who has not been approved by the NYSLA” to hold that license. * Licensees may rely on an opinion by the NYSLA Office of Counsel that provides that “a third party may allow a licensee to advertise its products on the third party’s website, provided that consumers are directed to the licensee’s website to place an order” and that the third party’s compensation is limited to a flat fee that is not contingent on the number of sales or the amount sold. * Arrangements where licensed sellers take a passive role and/or incur no business risk are prohibited. * Arrangements where an advertiser, third party marketer or other unlicensed party performs or is permitted to perform retail functions, such as deciding what products will be sold, what prices should be charged, how funds are controlled and distributed or the amount of the licensee’s profits are prohibited. * Arrangements where the compensation to a third party constitutes a substantial portion of the sales or sales made are prohibited. Notably, the NYSLA made clear that in evaluating the legality of these types of arrangements, it would not only look at the written agreements between the parties, but would also “evaluat4e the actual, practical, day-to-day functioning of the arrangements”, as it did in this case. On November 1, 2011, the California Department of Alcoholic Beverage Control issued an advisory on Third Party Providers, in which it stated that unlicensed third party marketers can facilitate the sale of wine over the Internet, provided that the benefited alcoholic beverage licensee at all times retains control over all sales transactions, including all decisions regarding pricing, selection, shipping and fulfillment. Under the California Advisory, a third party marketer would therefore be permitted to place advertising for an alcoholic beverage at the direction of a licensee, make buying recommendations to a consumer, direct consumers to specific licensees, receive orders and pass them on to the licensee for acceptance and fulfillment, process payments (although the licensee ultimately must control the funds and the flow of funds) and assist with shipping arrangements. But again, the licensee must at all times retain control over pricing, selection and fulfillment. The third party marketers may be compensated for their services, so long as the compensation is reasonable and does not result in any “actual or de facto control” over the licensee by the third party marketer. The CA Advisory and the NYSLA ruling are consistent to the extent that both require that control for alcoholic beverage sales be held by a licensed seller. However, there are notable differences between the approaches taken by these two agencies and it is unclear whether the NYSLA’s ultimate stance on these issues will be in line with the CA ABC. For instance, the NYSLA suggested that, pending the NYSLA’s definitive statement on these issues, licensees should rely on an opinion by the NYSLA Office of Counsel that provides that “a third party may allow a licensee to advertise its products on the third party’s website, provided that consumers are directed to the licensee’s website to place an order” and that the third party’s compensation is limited to a flat fee that is not contingent on the number of sales or the amount sold. These requirements are not included in the CA ABC Advisory and in fact sales made on third party marketers’ sites (rather than on the licensee’s site) and reasonable fee arrangements (other than solely flat fees) would be permissible under California’s regulations so long as they comply with the remaining portions of the CA ABC Advisory and California alcoholic beverage rules and regulations. A final decision on the permissibility of sales of alcoholic beverages using third party marketers will be forthcoming from the NYSLA and NYSLA intends to hold public hearings on the matter, allowing interested parties the opportunity to present their positions. In the meantime, license holders, third party marketers and other entities participating in third party marketing-type sales in New York should operate in accordance with the guidelines set forth by the NYSLA in the ruling. In the end, licensees, third party marketers and other parties involved with these transactions should keep in mind that the sales of alcoholic beverages using third party marketers remains a grey area and should keep close eye on how these issues develop throughout the country. The New York State Liquor Authority (“NY SLA”) is holding a special meeting on January 17, 2013 to discuss the role of third party providers in internet advertising and sales. This meeting is the result of a request from ShipCompliant for a declaratory ruling that its MarketPlace Platform does not violate New York state laws or NY SLA rules.Wineries as well as third party marketers should closely follow the result of this meeting, as it will impact their ability to market wine to New York state residents. These same entities have until end of the day on January 11, 2013 to submit comments to the NY SLA. Interested parties can attend the meeting, which is scheduled to start at 1pm at the NY SLA office in New York City (317 Lenox Avenue, New York, NY). According to ShipCompliant and Wines & Vines presentation, New York is among the top three states for direct to consumer wine sales. For more information on third party providers and third party marketing, please contact John Trinidad at jtrinidad@dpf-law.com. The California Department of Alcohol Beverage Control has reevaluated and reversed its position on third-party providers conducting marketing of alcohol beverage products over the Internet, as well as the propriety of licensing a trademark for use on alcohol beverage products without being a producer with an ABC license. This has come after a stakeholder committee, which was formed at the request of ABC, presented its findings to the Department last month. Mike Mann of Dickenson, Peatman & Fogarty was one of the industry members selected by ABC to be on this special committee. According to Mann, this was a process of numerous conference call meetings with participants on the committee from throughout the state. As a participant on the committee, Mann believes that “a lot of time and energy went into this by all of those involved and the outcome is a great step forward.” Mann points out, however, that there are also limitations outlined in the advisory of which everyone should be aware. The advisory is also of particular interest to trademark owners that license their trademarks for use on alcohol beverage products. Following the Department’s earlier advisory, it appeared that ABC was of the belief that a trademark owner could not license its trademark for use on alcohol beverage products made in California without also having some type of ABC license for the production or sale of such alcohol beverage. This position ran contrary to all concepts of trademark licensing as is traditional for most goods outside of the alcohol beverage industry. The full text of the new ABC Advisory may be found HERE. For more information or assistance on California ABC matters contact Dickenson, Peatman & Fogarty at info@dpf-law.com. For more information or assistance on trademark or intellectual property matters contact Scott Gerien at sgerien@dpf-law.com.